Thank goodness for the reference to María de Ágreda in Paul Horgan’s Pulitzer Prize-winning book, Great River. Now I know what’s going on in the moment. María appears on page 235 of this epic history of the Rio Grande, and she is the only woman to receive substantial attention in the entire 945-page book. Born in Spain in 1602, she is introduced to the reader as the Reverend Mother Superior of the Discalced Nuns of the order of Saint Francis at Ágreda on the borders of Castile and Aragón. As the history was unfolding of an area of the Rio Grande that is a hot spot in our awareness today, María de Ágreda was about 5,000 miles away. Nevertheless, she was aware of Spain’s dual mission in New Mexico. The conquistadors, who established a colony here in 1598, intended to serve God by inculcating the Indians into Christianity. They also intended to mine the country for silver and gold that would enrich both themselves and Spain. 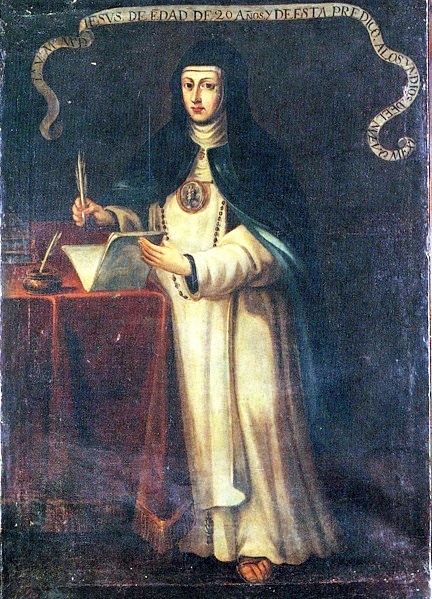 By 1629, there was “much talk” in Spain about how the Mother Superior had been transported to New Mexico multiple times to preach Catholic doctrine to the Indians. Back in New Mexico and as a result of this “bilocation,” members of the Jumano tribe near Mountainair, about 80 miles south of Santa Fe, were repeatedly visiting the developing Spanish colony, pleading to be baptized. When the Catholic church began carefully to document these reports, they learned that the Indians had been taught by a pretty young woman in a blue robe. A priest was charged with investigating this matter by traveling to Spain to interview the Mother Superior in 1631. She described landscapes and individuals she could not have known. She wore a cloak of blue sackcloth. The Mother Superior’s attention turned to other business after that interview. She published fourteen books and served as spiritual and political adviser to King Philip IV of Spain for more than twenty-two years. Over 600 letters between the two have survived. She was without doubt a very substantial person, who lived to the age of 63. Now, let’s go to the “heart of a problem” that Horgan refers to. An old warrior of Hernán Cortés was quoted as saying “We came here to serve God, and also to get rich.” That first goal went a little sour through the Spaniards’ disdain for the indigenous people. The second goal lost its luster when the search for silver and gold proved unproductive. As a result, the Spanish government imposed the encomienda system, which I have written about before. This system made landholders guardians of Indians. In fact, the Indians became slaves, forced laborers in mines and fields and in the construction of missions; and products of their work were collected as tribute. The priests often intervened to try to protect the Indians, but there were not enough of them to be effective. And as I wrote in an earlier post, it wasn’t long before the burdens of tribute, the diseases the Spaniards brought with them, drought, and attacks by neighboring Apaches decimated the three Salinas pueblos near here and their missions. It must have seemed that the arrival of the Spaniards and the Church had turned life into a living hell. And now back to Mother Superior María de Ágreda. Although she was an extraordinary woman in a time when only feminine royalty had great influence, her mission also seems flawed at this remove. She wrote that “God created these Indians as apt and competent beings to serve and worship Him. . . . ” It grieved her, she said, to see them deprived of the “immaculate, tender, and delightful” law of God. Her dedication seems ardent and sincere, and yet there were unintended and devastating consequences because her ideal would be implemented by a flawed institution. The drive of the Church also to deprive Indians of their own spirituality, their traditions, and their language has created psychic damage that troubles all the tribes even today. In addition, the Church wrested children from their homes in order to force them to be educated in English. So why is this important in the moment? Well, as I said in the beginning, the entire country is currently focused on an area of the Rio Grande River where the ills of invasion in multiple forms have come home to roost. And perhaps MarÍa de Ágreda has intervened to provide guidance. This is complicated so I will cut to the chase. However, if you ever come to visit, we will sit in my living room, and I’ll give you the detail of my discovery. You will probably laugh. Before beginning to write this post, I decided to do further research on María de Ágreda. Who, in a million years, would have predicted that it would lead me to a theory related to “non-equilibrium thermodynamics”? 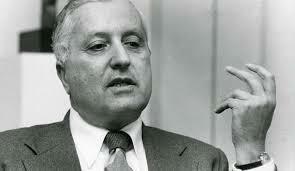 The Prigogine Principle awakened me to the current dismantling of multiple institutions that are no longer serving us. One majesty is our form of democracy, which is failing, at least in part, because it is a structure that is “coded as male.” At this moment in time, we desperately need a balancing representation of the long-ignored feminine perspective in order to come up with creative and humane solutions to enormous problems. With regard to the second majesty, the Catholic Church is compromised by its failure to protect the children it serves from the sexual abuse of priests. Within the majesty of religion in general, we have other belief systems that are also failing to provide moral leadership worldwide and in some cases have become agents of constant rancor and horrific violence. Finally, we have a new majesty, the majesty of monumental, individual wealth, which seeks to control government for its own benefit. Perhaps I will write more about that later. 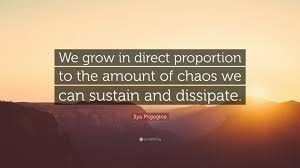 The Prigogine Principle, as I understand it, could be at work in that all of these majesties are, or will be, dismantling to make way for more evolved and enduring structures. María and Ilya, whose ideas are vastly separated by time and space, have given me hope. They provide an example of the brilliant kind of partnership the world needs for civilization to survive. We grow in proportion to the chaos we endure. Truly. So we, as a country, are growing again.